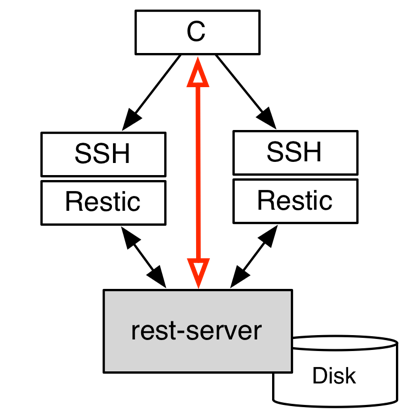 I want to be able to remote-control the launch of a restic backup via SSH from a “controlled” client (“C” in the diagram below) while being able to access the actual backup directly from “C”. The remote control is used so as to not have to keep the password of restic’s backend on the machines in the center. In this instance, the backup server is the rest-server as it’s the fastest restic backend. echo "** kick restic on $(hostname)"
This small script can optionally check $SSH_ORIGINAL_COMMAND to determine which portion of the system respectively which database it should back up. I’ve also prototyped a very similar setup with BorgBackup because we just might decide to use that in this particular case as pruning is quite a bit faster, and we’re interested in the different compression methods it has to offer.